The signs and symptoms of sickle cell disease vary. Some people suffer mild symptoms, while others develop very severe symptoms and are often hospitalized for treatment. Sickle cell disease is present at birth, but many infants do not have symptoms until after four months of age. 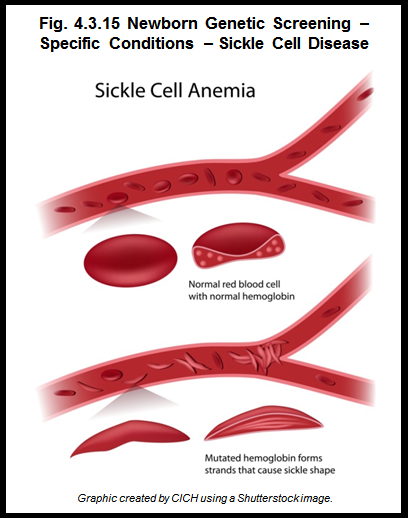 Sickle cell disease is a genetic condition and is therefore passed from parent to child. It can have severe physical, psychological, and social consequences for newly diagnosed patients and their families. Some children will be relatively healthy. Others, however, are admitted to hospital for immediate care. Recognizing sickle cell disease early is the key to preventing complications. Different treatments and medications can help to relieve symptoms that might occur with the illness. Most of these are linked to anemia, infection, and pain.1 Others are associated with disease complications. Sickle cell disease is a condition that affects the hemoglobin contained in a child’s red blood cells. It is often diagnosed during childhood but can also be detected during newborn screening. For information on the sickle cell disease screening programs offered throughout Canada, click here.